CAV technologies offer potentially transformative societal impacts— including significant mobility, safety, and environmental benefits. The U.S. Department of Transportation (USDOT) has led the development, research, and standards-making of these technologies and is currently developing deployment approaches and guidance. Deploying CAV applications requires transportation agencies to effectively and fully quantify the impacts of such deployments, and to identify which application best addresses their unique transportation problem. Current traffic analysis and planning tools, however, are not well suited for evaluating CAV applications because of their inability to incorporate vehicle connectivity/communication and automated features. There is a need to adapt and re-engineer the existing set of tools available to agencies, validate these models/tools, and provide a mechanism to share these models/tools with public agencies. Review prior and current CAV AMS work. Assess CAV data availability and future data sources for model development and calibration. Assess capabilities of existing AMS tools for analyzing CAV applications at the tactical and strategic levels (e.g., microscopic, mesoscopic, and macroscopic resolutions). The assessment will evaluate the usability/adoptability of these tools by transportation agencies. The assessment will review capabilities such as modeling major activity shifts and mobility use, new mobility industry supply options, and performance models. These components are generally unavailable in tools today and are of significance for CAVs. Identify current CAV modeling gaps and needs. Define an overall AMS framework to enable evaluation of the impact of CAV applications. Develop a proof-of-concept prototype using the framework. The prototype will be applied to a small-scale CAV application in a real-world network. The Turner-Fairbank Highway Research Center (TFHRC) has more than 24 laboratories for research in the following areas: safety operations, including intelligent transportation systems; materials technology; pavements; structures; and human centered systems. The expertise of TFHRC scientists and engineers covers more than 20 transportation-related disciplines. These laboratories are a vital resource for advancing this body of knowledge created and nurtured by our Researchers. The Federal Highway Administration’s Research, Development, and Technology Service Business Unit operates and manages TFHRC to conduct innovative research to provide solutions to transportation problems both nationwide and internationally. TFHRC is located at 6300 Georgetown Pike, McLean, VA. Information on TFHRC is available on the Web at www.tfhrc.gov. Proposed methodological framework for network- and system-level assessment of CAV impacts (Source: FHWA). 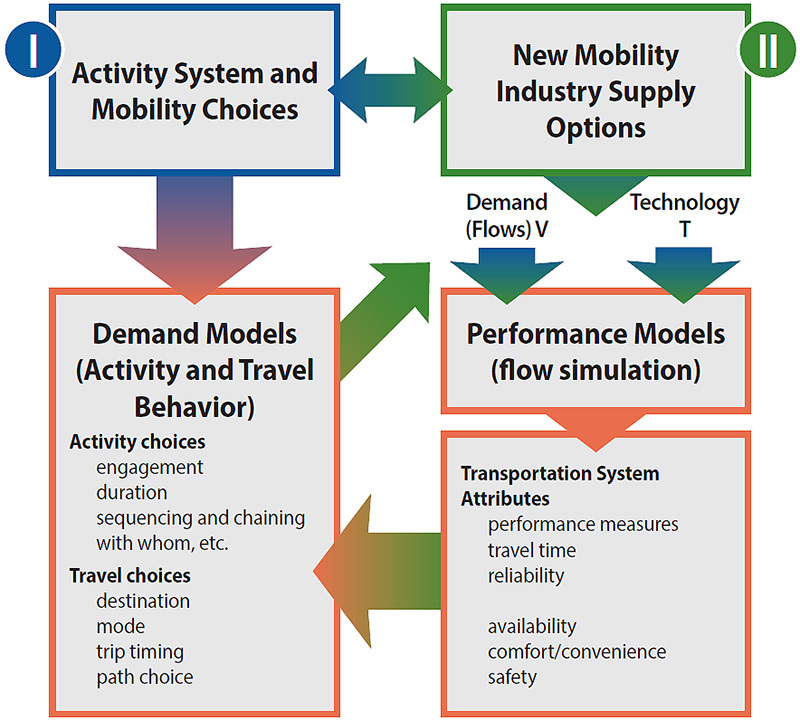 Figure 1 identifies two important components of the framework and the inability of current tools to address them: (I) major activity shifts and mobility use (e.g., changes in activity patterns due to CAVs and their use as a mobility tool) and (II) new mobility industry supply options (e.g., new forms of mobility options created by CAV technology). (I) and (II) influence existing demand and performance models, which will need to be improved to reflect CAV movement/operational logic.